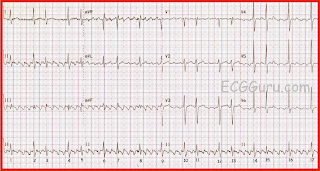 This is the 8th installment of my ECG Video Blog. This 58-minute video covers the Basics of AV Block — including Pearls on ECG diagnosis — clinical relevance — and distinction from AV Dissociation. Click Here for Timed Contents to the AV Block Video! My goal in this 58-minute video series is to review the approach to diagnosing the AV Blocks. This starts with recognizing what AV Block is (and is not) — what conditions may mimic AV Block (ie, blocked PACs) — and how to distinguish Complete AV Block from AV Dissociation. Focus is on the 3 types of 2nd-Degree AV Block (Mobitz I; Mobitz II; 2-to-1 AV Block) — and on how to make a definitive diagnosis of Complete AV Block. Below in Figure 1 — a sample of some issues discussed. I believe this video brings the topic to life! Figure-1: Slide reviewing the causes of AV Dissociation. The tracing illustrates Sinus Bradycardia with resultant AV Dissociation by "default" (ie, due to slowing of the sinus rate). NOTE — Enlarge by clicking on Figures — Right-Click to open in a separate window. Click Here — for a Timed CONTENTS of Video-Blog #8 on AV Blocks. As a source of tracings for practice and/or teaching — I have decided to LINK many of the ECGs I have commented on as Contributing Expert for ECG Guru (www.ecgguru.com). NOTE: The ECG Guru is dedicated to providing free resources for ECG Teachers and their Students. Search the ECG Guru site if you ever are in need of cases on a particular subject. 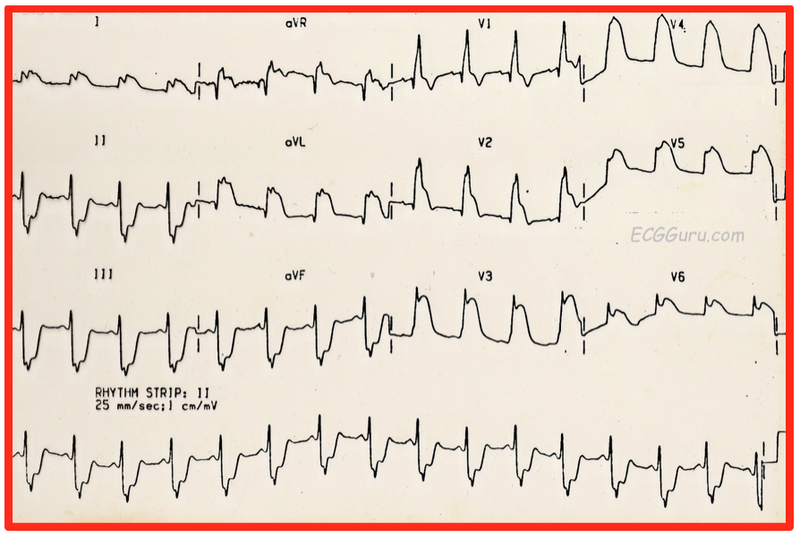 ECG Blog #103 — Acute MI ECGs (Comments #848; 838; 823; 819; 801 ). ECG Blog # 104 (Comments #828; 836) — AV Blocks/AV Dissociation. ECG Blog #105 — AV Block Basics Video (www.avblockecg.com). 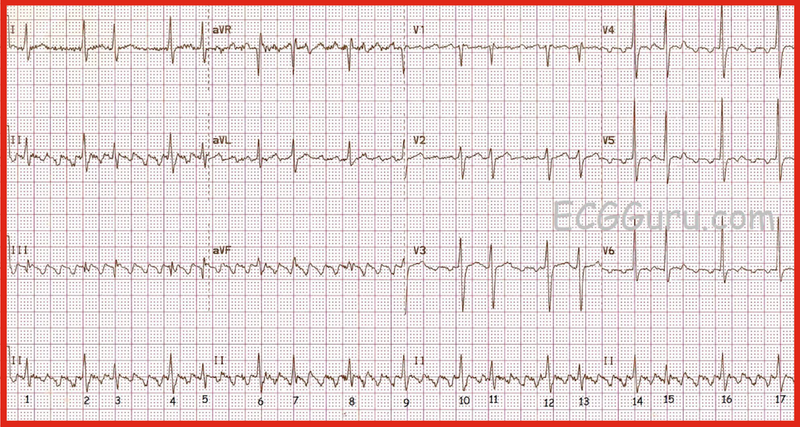 ECG Blog #123 — LINKS to My ECG Guru Posts (Volume-1). ECG Blog #124 — Using a Normal ECG for Teaching (ECG Guru). This ECG was obtained from an 84-year old man who became dizzy and fell. He was not injured in the fall. Subsequent ECGs showed progressive slowing that clearly required insertion of a pacemaker. 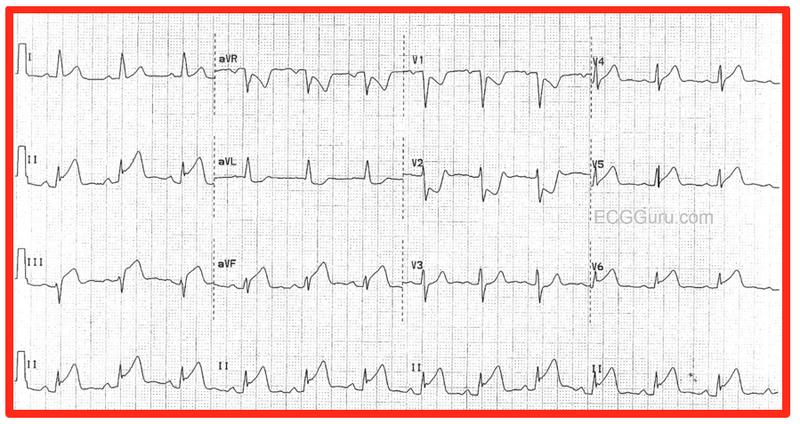 How would you interpret this 12-lead ECG — given that this 84-year old man presented with syncope? Is there complete AV Block? Is there complete AV Dissociation? Are you certain? What happens at the end of this 12-lead ECG? Figure-1: ECG obtained from an 84-year old man admitted for syncope. (Our gratitude to Sebastian Garay for use of this case and all tracings.). For My Interpretation — See ECG Guru Comment-828. This ECG was obtained from an 62-year old man. Unfortunately, there is no clinical information available. How would you interpret this 12-lead ECG and long lead II rhythm strip? Can you explain the change in QRS morphology? For My Interpretation — See ECG Guru Comment-836. 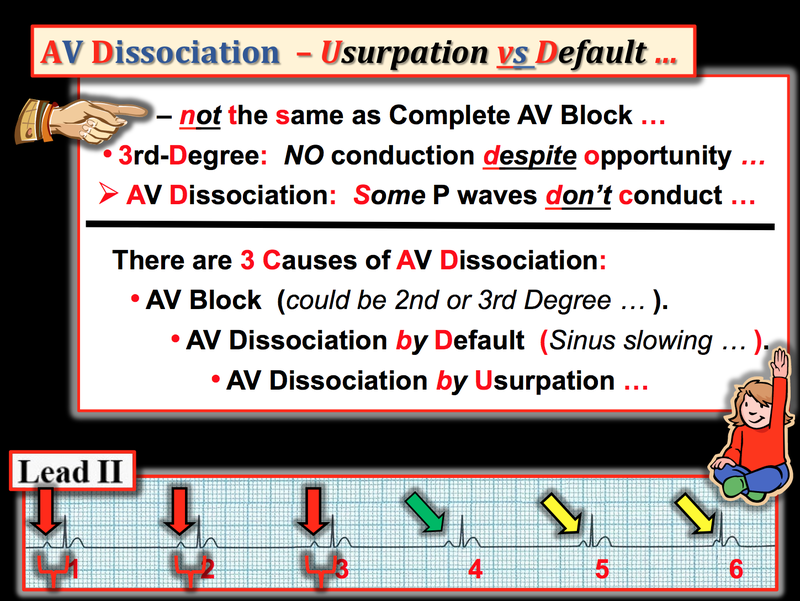 ECG Blog #104 (Comments #828; 836) — AV Blocks/AV Dissociation. 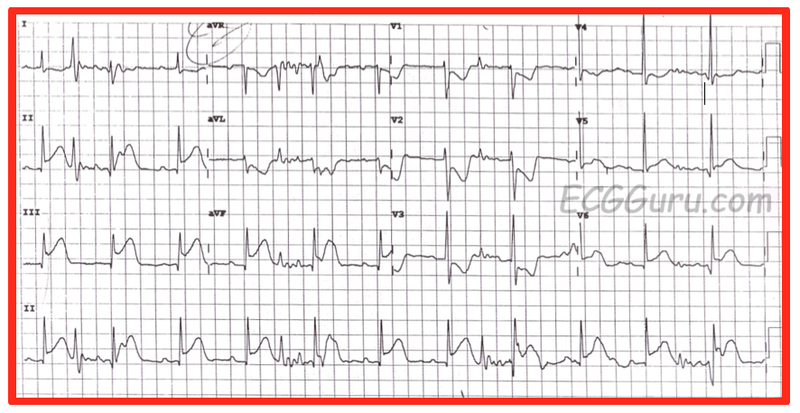 How would you interpret this ECG — given that the patient has new-onset chest pain? What is the "culprit" artery likely to be? Figure-1: ECG obtained from a patient with new-onset chest pain. For My Interpretation — See ECG Guru Comment-848. How would you interpret this ECG — given the not unexpected history of chest pain? 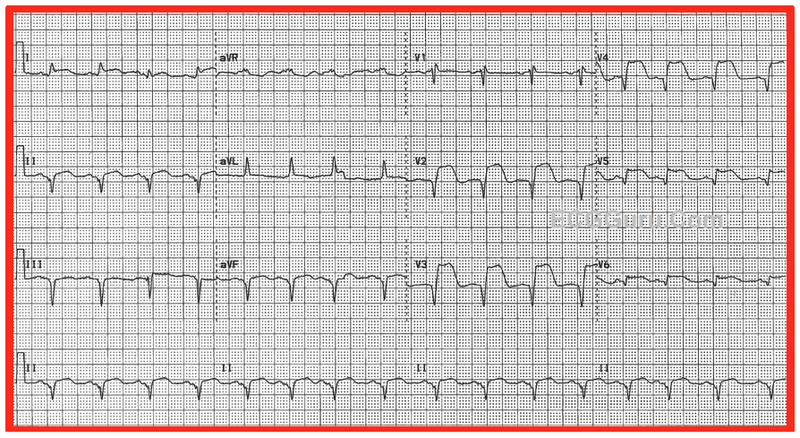 Do the ECG findings shown here suggest LMain "disease"? Figure-1: ECG obtained from a patient with chest pain. For My Interpretation — See ECG Guru Comment-838. This ECG was obtained from an 88-year old woman who presented to the ED (Emergency Department) in cariogenic shock. She apparently had been "ill" for several days prior to arrival in the ED. What would you expect to find on cardiac catheterization? (Cath films are shown at the above link on ECG Guru). Is all that you see on her ECG likely to be new? Figure-1: ECG obtained from an 88-year old woman who presented in cardiogenic shock. What would you expect to find on cath? For My Interpretation — See ECG Guru Comment-823. Interpret the ECG. How many abnormal findings can you detect? Comment on the cath findings. 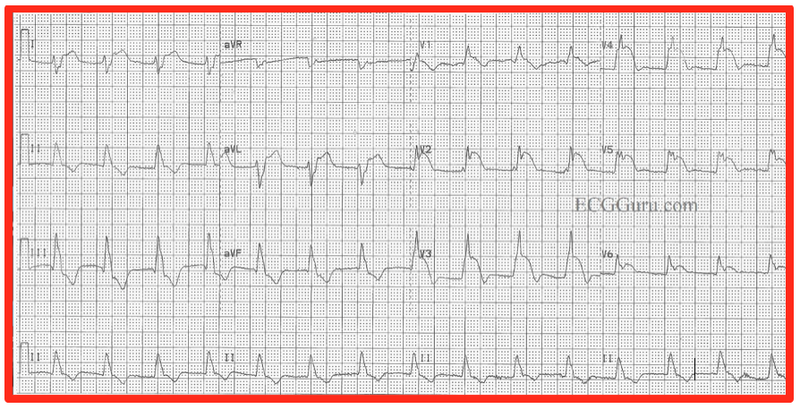 Can one distinguish on ECG between proximal LAD vs LMain occlusion? Figure-1: ECG obtained from a patient with LMain occlusion. Are you surprised by this cath finding? For My Interpretation — See ECG Guru Comment-819. Do you agree with the computerized interpretation of the rhythm? Which arm should you check first on the patient? (ie, What is the likely source of the artifact?). Figure-1: ECG with lots of artifact ... Is the rhythm AFib (as the computer says)? What else is going on? For My Interpretation — See ECG Guru Comment-801.